05/02/2016 05/20/2016 Mike S.5 Comments on Topix Showcase: Show Us Your……Dirt? Topix Showcase: Show Us Your……Dirt? I think we’re way past due on a few fun articles instead of the normal wave of walkthroughs and guides, which are vital but we need to mix things up a bit right? 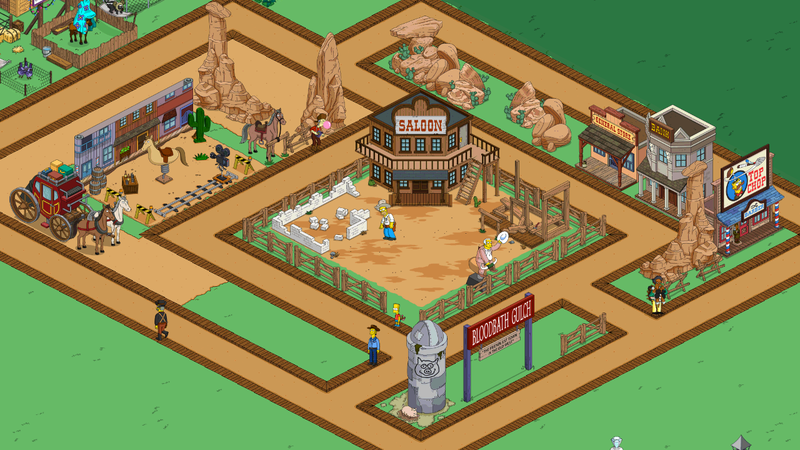 One of the great new additions to come with the Wild West event was 2 new surface tiles: dirt and dirt roads. These new tiles are the first and only additions to the surface options to be added since the game’s inception and were a welcome addition to the game. I literally heard a collective “Yaay!” across the Tapped Out Design world when these came and many of you went right to work on making these fit perfectly into your terrifically designed towns. To others, however, these new tiles brought on many a puzzled facial expressions. “How can I use these?” “What’s the best way to fit dirt into my game?” and so on and so forth. One of the more popular articles that used to be a regular series on a long ago shuttered Tapped Out blog was the “What Have You Done with ……?” post series. A few sites still in existence today still roll out their version of this concept which are favored articles to many readers. The purpose of these articles are to give you, the reader, a chance to show off your primo design skills and for others, a chance to get some really good design ideas for when they are stumped or have hit a wall. I’ve created a group on Flickr dedicated to this very idea and there are tons upon tons of groups, pages, and sites also dedicated to the design aspect of Tapped Out. This is your chance to open your games, go to your best or favorite part of town that you have used the new tiles, take a screenshot and share it with Topix and all of our readers. Not only will it allow you to show everyone your design skills but also help others gain design ideas. I know myself, I am having a tough time making the dirt work so I am desperately in need of design ideas. We will pick our favorites and use them in a future post of results which we will allow our readers to vote on and who knows, one of you awesome Tappers just might win some glazed pastries for your towns. So please show us what you got, give us your best shot and any other fun pun or photo-related quirky phrase I can think of. Aaaand go! 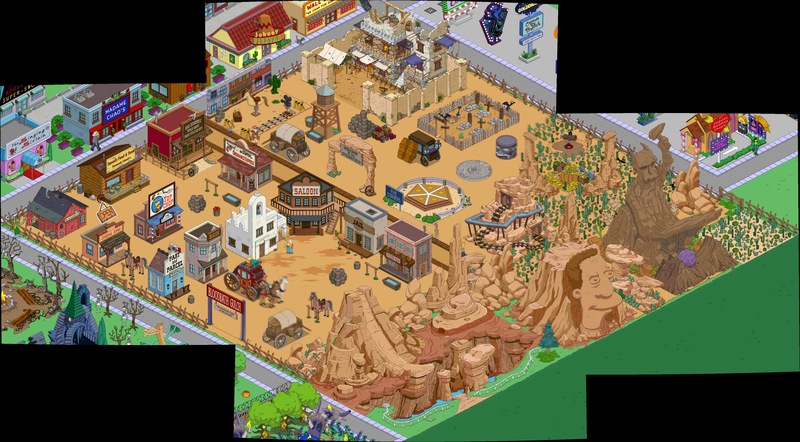 Now that I’ve finished building my Wild West, here’s an updated pic. 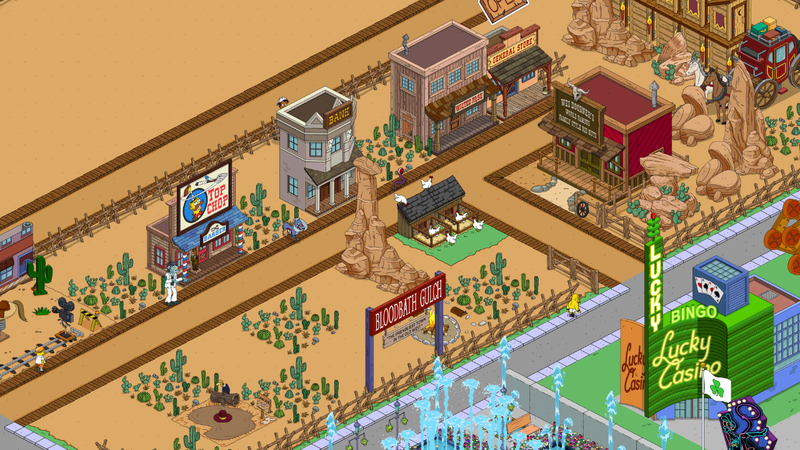 Basically I tried to separate the town area from the wild desert area. I love these kind of posts. Take me back to the early times of tsto when we almost always have these show-off kind of topics. As for myself i always wait until the end or near the end of an event before i really start designing my town / area related to that event. That way i already have most of the buildings available and i can start designing in one go. Maybe i can have a look here first for some ideas. 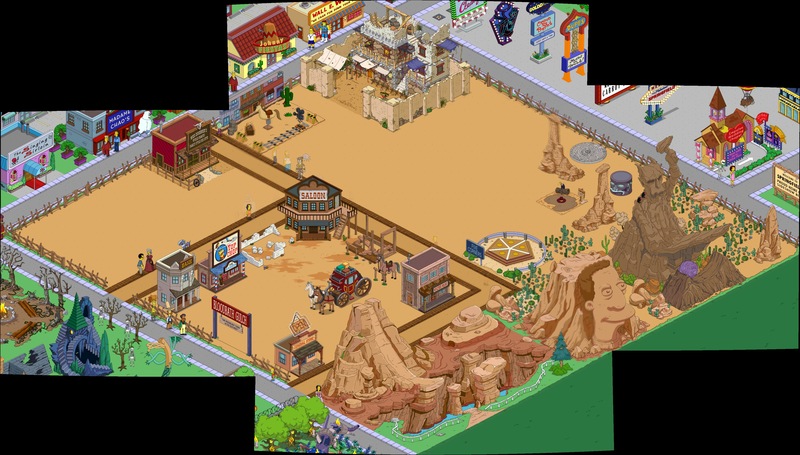 I really hope we can buy those daily challenges rocks as i plan to have them as a boundary between normal and dirt Springfield. They look good in the front. Previous Wild West: Last 24 hours for Act 1!